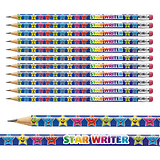 There are 35 stickers per sheet each one has a diameter of 20mm. 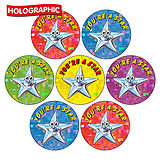 This design is one of the PTS favourites, now in holographic, with its bright colours and child friendly design, your learners will enjoy the reward of one of these stickers. 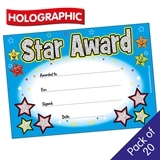 Star Fact - A star is a massive, bright, sphere of very hot gas called plasma which is held together by its own gravity. Source - sciencekids.co.nz.